I make a lot of homemade bread so I buy flour in bulk. To make measuring easier I keep a mandarin orange can in my flour container. It measures 2 cups and has grooves inside at the 1/2 and 1 cup level. 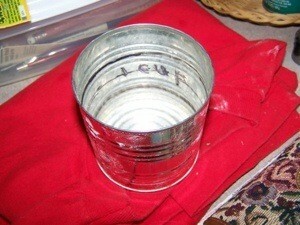 I took a marker and drew a line around the inside of the can at those levels for a quick measure. Source: Lucky accident on my part. That is too cool! Very smart and inventive. Before yogurt cups went from 8 oz. to 6 oz., you could get a lot of help from those little guys. When I get a lot of bulk foods, I separate what I buy so I can grab it and go. How much do you usually use for mac and cheese? Put that much in a tin or pringle can, etc. Do you make a pie each week? How about separating the flour you need and keeping that in the pantry. I pre-mix my coatings for chicken and fish, and keep that in old mayo jars so I can see what is inside. This was a great idea! I am a great believer in recycling. I use the small pineapple can for a biscuit cutter. Just cut both ends and wash thoroughly. There are other sizes for smaller biscuits or cookies I also save my small yogurt cups for planting seeds for spring crops.Of course you have to start the seedling in late winter.